Ceramic 3D printing represents about 11% of the global 3D printing industry, which BCC Research says is humming along at a greater than 20% CAGR through 2022. And that impressive growth rate is even slower than the total market for 3D printing of technical ceramics, which is forecast to blaze at a 25.6% CAGR from 2017 to 2022. 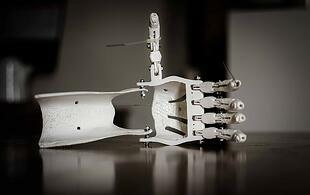 Although consumer products, primarily pottery, dominate the market, the development and commercialization of 3D printed technical ceramics for applications in sectors like healthcare is booming. Recently, a collaboration of international researchers developed complex 3D printed ceramic microsystems that could advance labs-on-chips and organs-on-chips. The 3D printed ceramic microsystem also introduces the potential of ceramic materials for use in place of animals or petri dish samples. Developed by researchers with the Universidad Politécnica de Madrid and ceramic 3D printing company Lithoz GmbH, Austria, the octagonal chip can be 3D-printed by means of lithography. The ceramic device, an octagon-shaped chip, was 3D printed using Lithoz’ CeraFab 7500 machine, a lithography-based additive manufacturing system. The material used to print the bio chip is a ceramic that has been mixed with a photopolymer, which enables it to solidify when exposed to light during the printing process. As a single solid piece, the fabricated chip prevents leakage of valuable live material added for medical studies. Josefa Predestinación García-Ruíz, lead author of the study, says the lithography technique provides the most appealing compromises between overall part size and precision when working with ceramic materials. Because the replication of blood vessels is the main goal of an organ-on-a-chip type device, the team designed the eight-sided chip with four channels and inlets, according to García-Ruíz. These compartments can be used to introduce multiple types of cells and gradually build-up tissue as it would exist in the body. A grid membrane is also placed at the center of the chip, creating a well at the bottom of the device. In experimentation, cells show good adhesion to the grid, meaning it could be used as a bio scaffold to grow a larger mass of tissue. “Such a design may enable the in vitro development of several types of tissue models or physiological interactions using just a single and versatile multi-well, multi-channel and multi-layer microfluidic platform,” noted the scientists. “The microsystem obtained provides one of the most remarkable examples of monolithic bio-microsystems and, to our knowledge, a step forward in the field of ceramic microsystems with complex geometries for lab-on-chip and organ-on-chip applications,” the researchers wrote. The paper is published open-access in the International Journal of Advanced Manufacturing Technologies.